Vidalia Onions are especially great as gifts! We have many customers who like to impress their friends and loved ones with a gift of this delicious treat or any of our Vidalia Onion products. 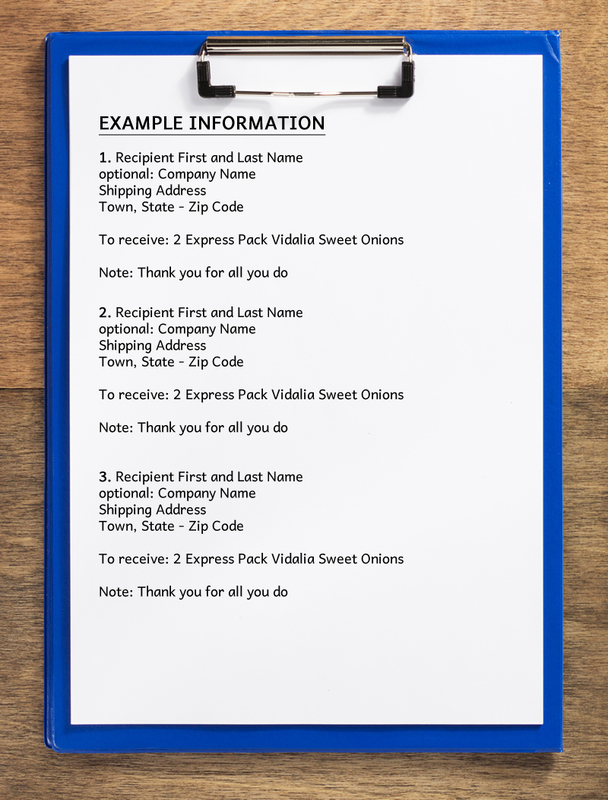 Many small to large businesses have found that their customers delight in receiving a gift of Vidalias, and in fact look for them every year. Our online store allows for three unique gift recipients per order. If you wish to place an order for more than 3 recipients please use the form below to provide us the necessary recipient delivery information. For businesses or individuals we can also include your business cards or any other information that you would like inserted in the packages. ***YOU MUST PLACE OUR ORDER FIRST! Commentsanything else we need to know?